Welcome to the first edition of our completely redesigned Heffner Review. Over the issues, we’ll cover everything from new vehicle releases, to tech tips, advice from different departments throughout our dealerships and even highlights from our Social accounts. 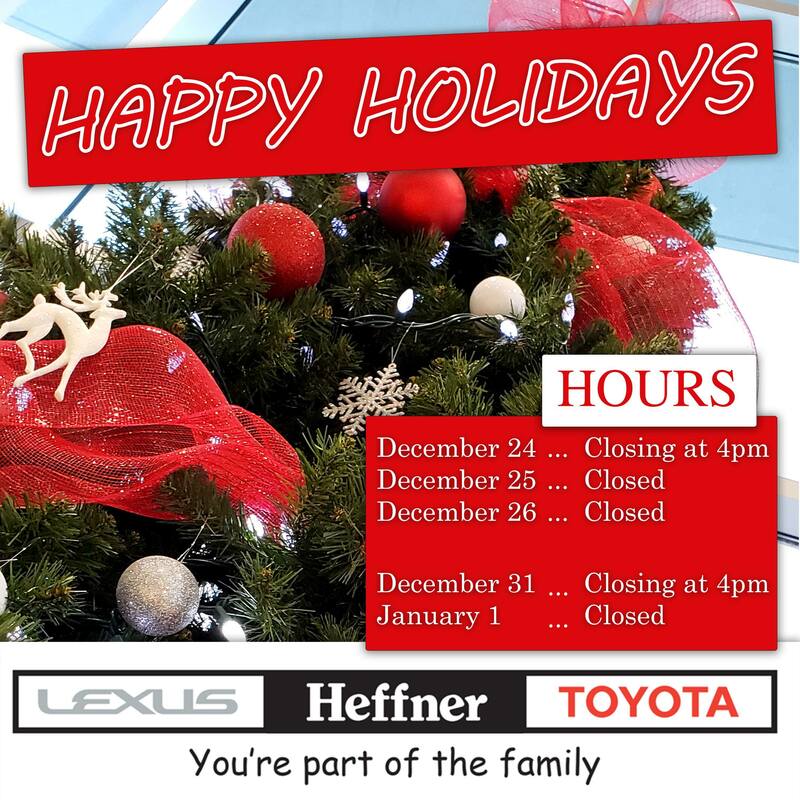 We’ll keep you up to date with everything you need to know from Heffner Toyota and Heffner Lexus. Buying a used vehicle is a lot like dating. Both you and the other party – in this case the used vehicle that’s caught your eye – has had a life before your acquaintance has ever been met. And like with dating, a big part of the courtship process involves finding out if there’s a match, getting to know the lifestyles you live, and discovering all the past history before you make a serious commitment. To reach all of these goals, transparency is crucial. It’s the most important part of the entire process. 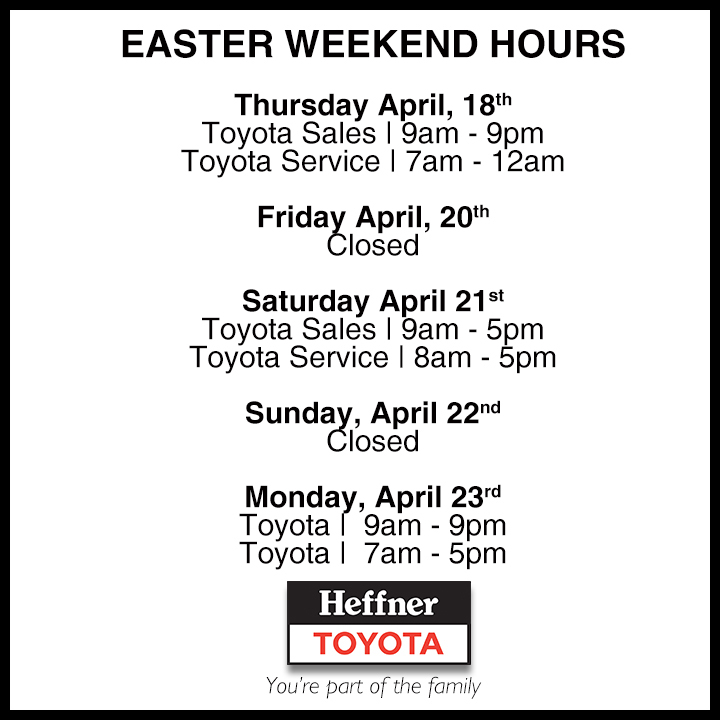 At Heffner Toyota, we want you to have the details, all the details, so that you can make the most informed decision possible. We wouldn’t treat family any other way, and you shouldn’t accept anything less. At the Heffner Used Vehicle Centre, there are 4 ways you can buy a used vehicle. Here’s a quick breakdown of each. This is the crème de la creme, top of the line, an honour held exclusively for Toyota vehicles. When you see TCUV on a vehicle, you know you’re looking at quality. These are our most sought after used Toyota vehicles. We hold them to the highest standard possible; a solid step above any requirements put out by the Ministry of Transportation. Also, when you buy TCUV with Heffner Toyota, you get an exclusive bonus; a 4 month / 6,500 kilometer comprehensive warranty with zero deductible. Plus, enjoy peace of mind with a onetime 30 days or 2,000 km exchange. We even throw in a second oil/filter change at no charge. Complimentary CarFax provided at no charge to ensure complete disclosure. Finance rates as low as 2.9% on select TCUV’s. 12 months unlimited Roadside Assistance. Rigorous 160 (gas) 176 (hybrid) point Quality Assurance Inspection, including safety inspection and e-test. All vehicle maintenance brought up to current Toyota guidelines. Minimum 6-months / 10,000 kms Powertrain coverage backed by Toyota and honoured at over 1500 Dealers in Canada & the USA. Extensive mechanical and appearance reconditioning. Vehicle has been cleaned and detailed to our highest standard. First oil / filter change at no charge. Complimentary full tank of gas. 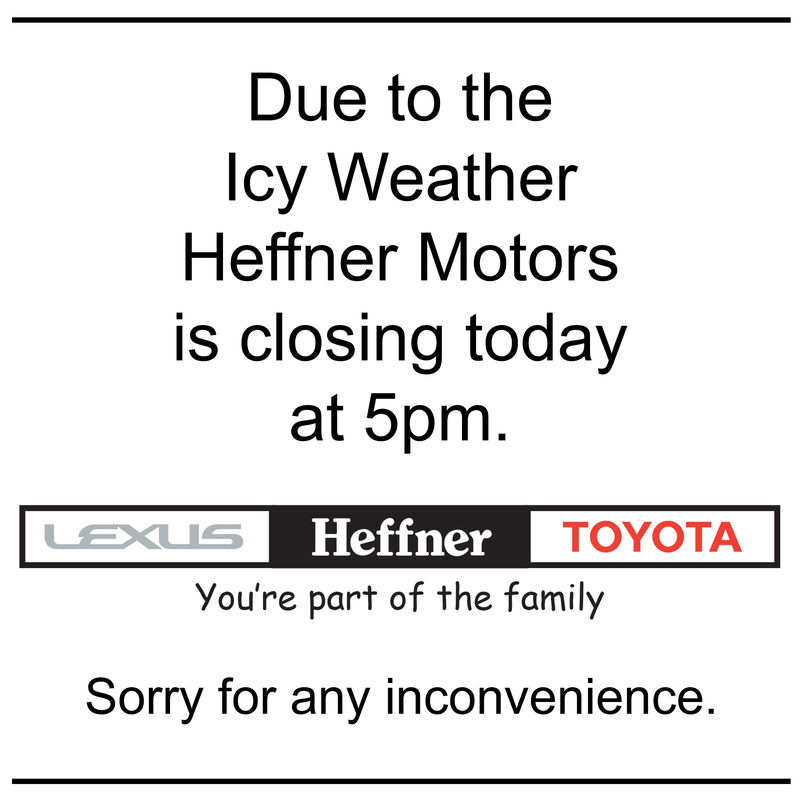 These type of vehicles are only available at Heffner Toyota. They can be of any brand as long as they live up to our high standard of approval. That’s the only way we have the confidence to put on the Heffner personal “Stamp of Assurance”. This is our exclusive level of mechanical reconditioning. Rigorous 127 point Quality Assurance Inspection, including safety inspection and e-test. 4 month / 6,500 kilometer comprehensive warranty with zero deductible honoured at Heffner Motors Ltd. Vehicle safety equipment is 100% operational and meets or exceeds standards set by the Ministry of Transportation of Ontario. One time 30 day / 2,000 km exchange privilege. Complimentary first two oil changes. These are our most affordable certified vehicles. They have passed the vehicle safety inspection set out by the Ministry of Transportation. No other maintenance needs to be done to transfer ownership and to get it on the road. Comprehensive vehicle safety inspection to Ministry of Transportation of Ontario standards. Wash, wax and interior detail performed on the vehicle. 90 day / 6,000 km power train warranty. One time 2 week / 1000 km exchange privilege. The final way to purchase a used vehicle is “As Is” and this is just how it sounds. The vehicle is on our lot the way it came in, as is, and still needs to be safetied before you can take it on the road. The price also reflects this, as some work will need to be done to get it up to Ministry of Transportation standards. One other thing to take note of is our 3 Month Deferral program at Heffner Toyota. This applies to any finance deal that qualifies for a regular bank loan. If approved, you can put off making your first payment for 3 months; a handy program to take advantage of. 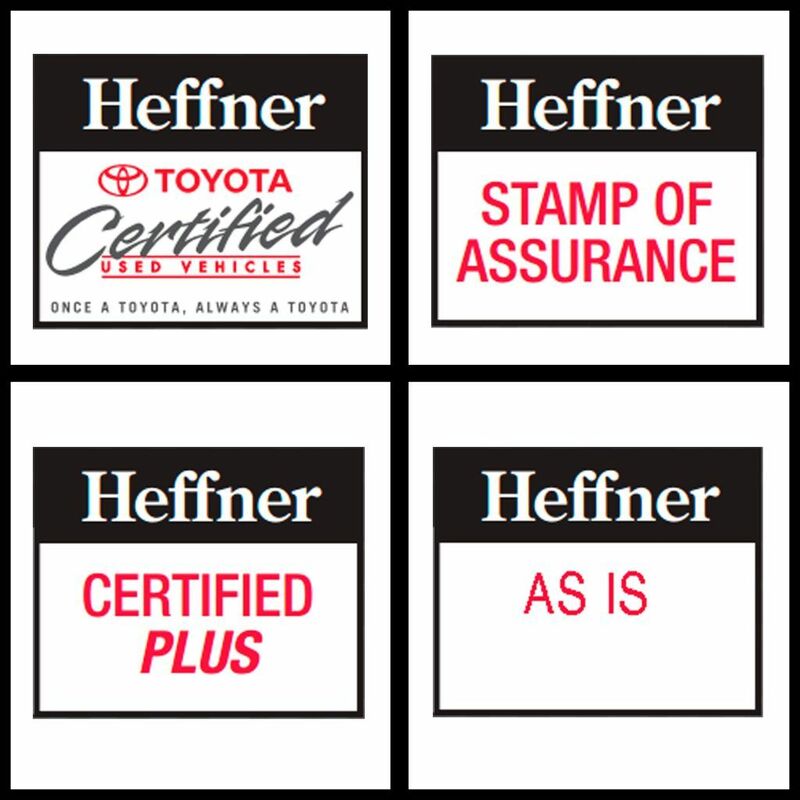 Now that you know the difference between a Toyota Certified Used Vehicle, one with our Stamp of Assurance, a Certified Plus vehicle, or As Is, we hope when the time comes, you have the confidence and knowledge to make an informed decision when buying your next used vehicle. 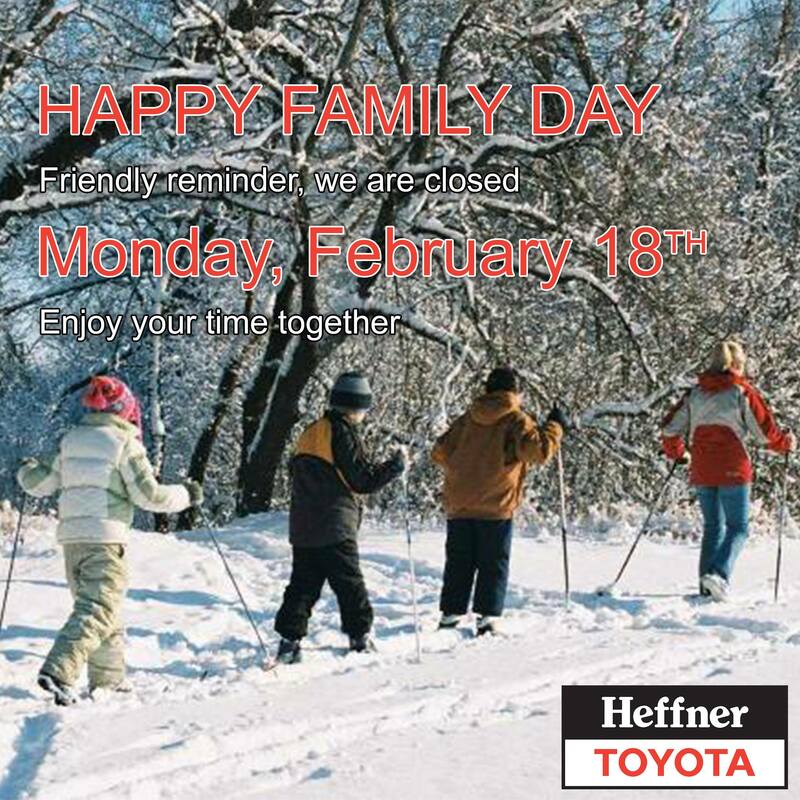 And remember, it may be used, but it’s new to you, and Heffner Toyota will have it looking the part. Until next time, thanks for reading. The first for anything is always pretty exciting, which is definitely the case now for Lexus as the first ever 2019 Lexus UX – UX stands for Urban Crossover by the way – was released earlier this year to great reviews. Expressly crafted for the urban explorer, the UX is innovative, agile, luxurious and connected. It’s a fresh take on the compact luxury SUV and the first subcompact Hybrid SUV. It’s available as a gas engine with Front Wheel Drive, or as a self-charging Hybrid and All-Wheel Drive. Plus, both have F Sport packages. From your first corner you’ll immediately discover the razor’s edge handling of the UX. It’s extremely quick to respond thanks to the tightest turning radius in its class and low center of gravity. The UX handles like a dream. It’s also filled with intuitive technology keeping you connected to the world around you with Lexus Enform 2.0 and Apple CarPlay on the standard 7” or available 10.3” display. Enform also lets you rest easy as a live Enform Response Agent is ready to send assistance in the event of an emergency. Other available features include wireless charging so you’re always running on full, head-up display so you can keep your focus on what matters ahead and hands free liftgate which activates with a wave of your foot under the rear bumper. Lexus Safety System + 2.0 is standard on the UX. Some of the many features include Pre-Collision with Pedestrian and Bicycle Detection, All-Speed Dynamic Radar Cruise Control, Lane Tracing Assist, Auto High-Beam and 10 air bags. Plus, favourites like Intuitive Parking Assist with Auto Braking and Blind Spot Monitor. And don’t let the term subcompact fool you, the UX has more than enough room for you and your cargo. Stuart Wright, one of our Product Advisors at Heffner Lexus is 6”7’ and he still fits comfortably behind the wheel. 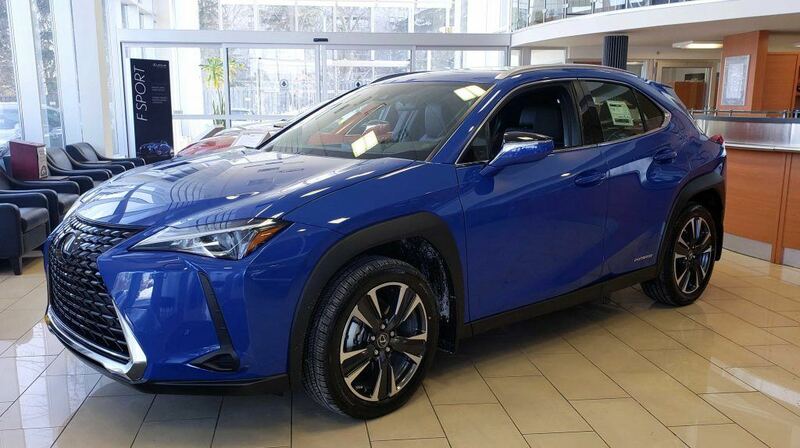 There you have it, a quick glance at some of the highlights surrounding the all-new 2019 Lexus UX, from city-smart technology to its bold urban style and standard safety features. The UX isn’t just right, it’s right for you and your active lifestyle. For further information, please contact one of our Product Advisors or visit heffnerlexus.ca where you can Configure & Price in the comfort of your home; pick your trim, pick your options and see your price. One look is all it takes to see how drastically different the new 2019 Toyota RAV4 is compared to previous years; and you don’t have to be a car guru to take notice. For one, it’s bigger – a half-inch higher – as well as beefier and more rugged with a new exciting look across all trim levels. The height of the front hood has been lowered to reduce blind spots on the corners making it easier for the driver to see. 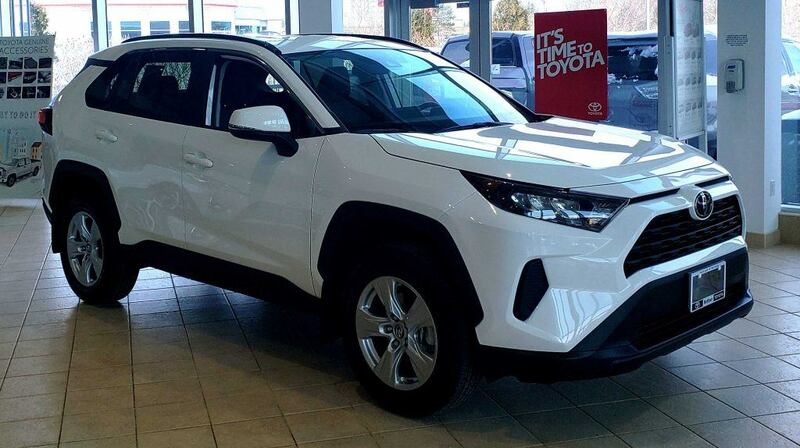 Another exterior change, pointed out by Karen Savage, Senior Sales Specialist, at Heffner Toyota, are the lowered side mirrors providing a greater view between them and the A column. The back side windows also teardrop down, opposed to the upward direction previously. This improves your blind spot view. The interior has be revamped as well, a different design across all trim levels, but overall, a bigger RAV4 outside means more room inside. One cool feature to note is the ability to lower the back cargo area. This gains you close to 3 inches when extra room is needed. The cargo mat is also reversible giving you the option to switch between carpet and plastic depending on what you’re hauling. Taking a look at safety, the 2019 boasts Toyota Safety Sense 2.0 featuring Pre-Collision System with Pedestrian Detection, Adaptive Cruise Control, and Lane-Departure Warning with Steering Assist. Plus, new on this year’s model is Lane Tracing Assist and Road Sign Assist. Adam Linka: Blind Spot Monitoring is available on all trim levels which is simply amazing. If you haven’t had the opportunity to try it out yet, do so, you won’t want to drive without it. Jake Hebscher: I love the Rear Cross Traffic Alert System. It uses the side sensors at the rear of the RAV4 to pick up any cross traffic that is coming behind you while you’re in reverse. Perfect for tight spaces, like in parking lots. Matt Bennett: The Rear View Camera on the Limited is so helpful when you have a full cargo load or taller travelers blocking your view. Simply push a button on your rear view mirror to activate the camera. It also stays on when you’re driving. Switching to technology, the centre touchscreen is bigger for a better display of Entune 3.0 and Apple CarPlay. The 2019 Toyota RAV4 also has 5 USB ports so the family never has to share again, or worry that their device might run out of juice. The 5th generation RAV4 truly is as unique as you are. It’s available in a variety of trim levels – LE, XLE, XLE Premium, Limited and Trail, plus the XSE Hybrid which will be released in April. The only question that remains is, which 2019 RAV4 is right for you? The robust and refined Limited allows the Weekend Warrior to arrive in style wherever that destination may be. The tough, off-road ready Trail Edition is for the Adventurer who seeks maximum traction through snow, mud, sand, rocks or dirt. The powerful and sporty XSE Hybrid is for the Urban Explorer cruising the city and suburbs, whether day or night. Get ready to go someplace new, whether it’s uptown, around town or out of town. Every day deserves more adventure. Squeeze more out of modern life with the all-new redesigned 2019 Toyota RAV4. For further information, please contact one of our Product Advisors. Matt Bennett, Product Advisor at Heffner Toyota, quickly demonstrates how simple it is to pair your Android device to your Toyota’s Entune system. If you have the Scout GPS app, you have the ability to receive turn by turn directions via Bluetooth. You can also tether your phone with a USB cable to have maps come up on your display screen. 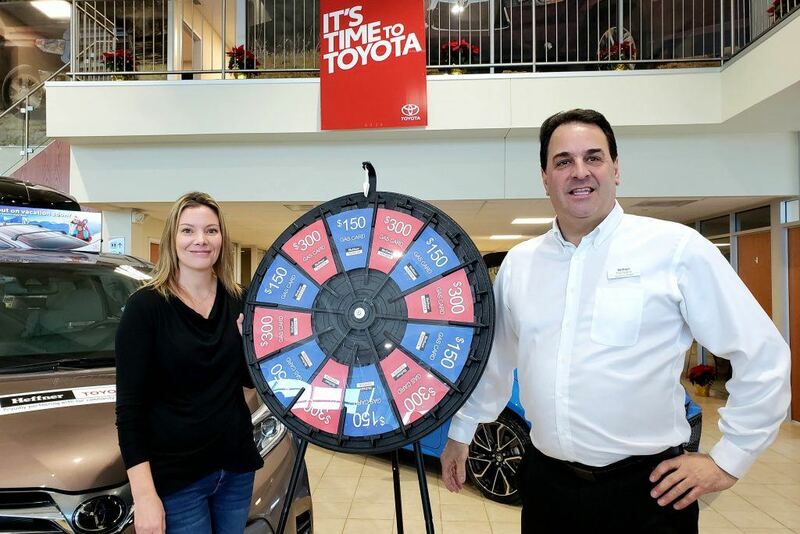 Congratulations to Emma Walpole who won our Instagram “Spin to Win” contest associated with the official launch of the 2019 RAV4 at Heffner Toyota on January 19th. …a $150 gas card after her big spin on January 24th. Congrats again Emma! Don’t miss our next online contest. Make sure you follow us on Instagram because you just never know when, or where, your next chance at winning will come from. You can follow us on Instagram by clicking here. Thanks for reading our first edition of our redesigned Heffner Review. If you have any thoughts, comments, suggestions, or anything else, please feel free to email Ryan with them. Thanks again!